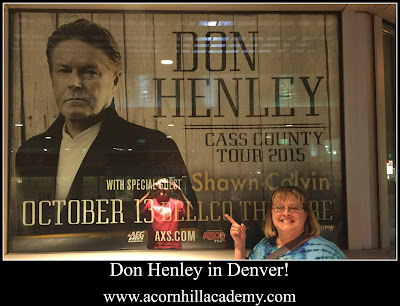 Tuesday night, my husband and I went to see Don Henley at the Bellco Theater in Denver, CO. It was a bit of a fluke, actually. My daughter was looking at the paper last Friday, and saw a little ad for the concert. She looked up the ticketing site. I was on my way to the dentist, so I asked my husband to get the tickets, but he had some trouble with their system. I ended up booking them on my phone while my very patient dental assistant waited for me to complete the transaction. I did apologize to her for my rudeness, but she did understand when I told her the show was Tuesday. 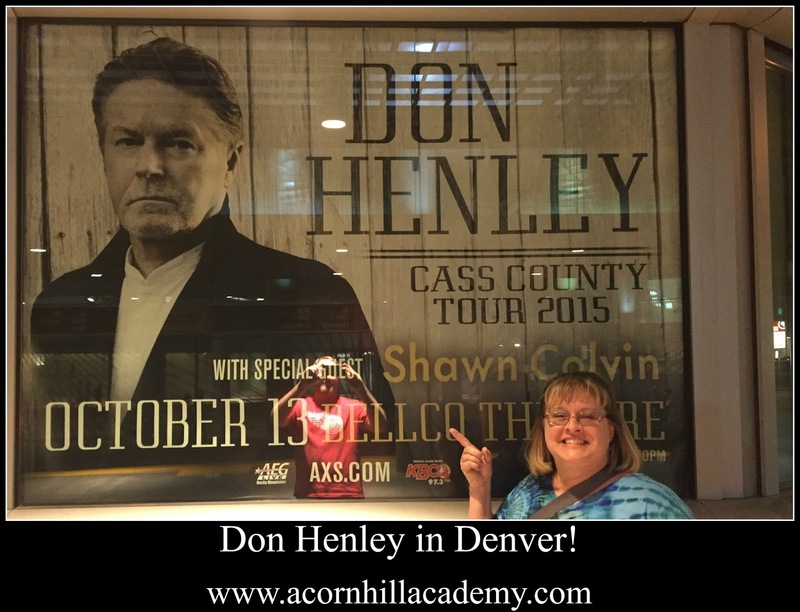 When Mr. Henley came out on stage, he said, "I'm in the Mile High City, and feeling every inch." I laughed in complete sympathy! Its a killer when you're not used to it. He commented a couple of times throughout the evening that he was struggling with the altitude, but it didn't affect his performance. He never sat down, even though the last time we saw the Eagles they sat for an acoustic set during the concert. His voice was top-notch - he hasn't lowered the keys of any of his tunes (trust me, I sing along with them all the time; I would have noticed), and he sounds as fabulous as ever. It was a fantastic evening. 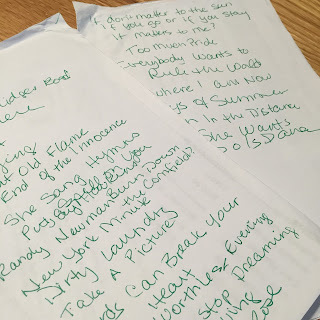 I thought I did a pretty good job of writing down the list of songs in the dark. I like to do that so I can put the songs into a playlist for my girls. They like Don Henley, too. The stage show was kept pretty simple: no pyrotechnics or crazy lights. There were several old radios hanging down from the ceiling, and before the show opened, a light would shine on one of them and a snippet of an old song would play. It was a snapshot of (popular) music history. It was fun to hear the crowd singing along with some of them when the music changed. The volume was at at a great level, too–loud enough so you couldn't hear anyone else singing, but not so loud that I couldn't hear when the show was over. I know, I know, "if it's too loud, I'm too old," but after years of sitting next to the drum line in my college marching band, and some rock concerts without ear plugs, I appreciate the hearing I have left, thanks. There were three lovely young women singing backup, and they each performed one of the duets with him from the new album. They were amazing. I wish I could remember their names, because I'd tell you to listen for them on the music scene. I have to believe they have long careers ahead of them. If anyone had asked my opinion before the concert began, I would have suggested they play more of his older stuff. I'd have loved another Eagles song or two. However, he did sing "Heart of the Matter," which was really my only requirement (and it was all about ME - ha). Don showed, again, what a talented and versatile musician he is. He can do it all - country, rock, folk, blues, you name it. A brief review of the album: this is a country record. It's much different than any of his previous solo work, but if you know much of the Eagles' music, there is a country feel to many of their songs. Don Henley grew up in Texas, and wanted to explore the musical history and culture there. There are many guest appearances, including Miranda Lambert, Mick Jagger (yes, you read that right), Merle Haggard, and others. I wasn't sure I liked the album at first, but it's growing on me. It helps that we saw the show, because now I have memories associated with most of the songs. I'm so glad we got to go! I considered not posting this, because I thought, "this has nothing to do with homeschooling!" It does, though, because it reminds me that I have a life, and things I enjoy outside of my children. It's an important part of keeping myself sane. I do love to go to concerts. Do you? What's been your favorite show? My husband and I just saw Don Henley in Washington DC on Thursday night. (I won tickets in a radio giveaway!) His set list was very similar and he did a fantastic show! I was very impressed and although I don't yet own that new CD I do plan on getting it since I absolutely loved the stuff he played from it.